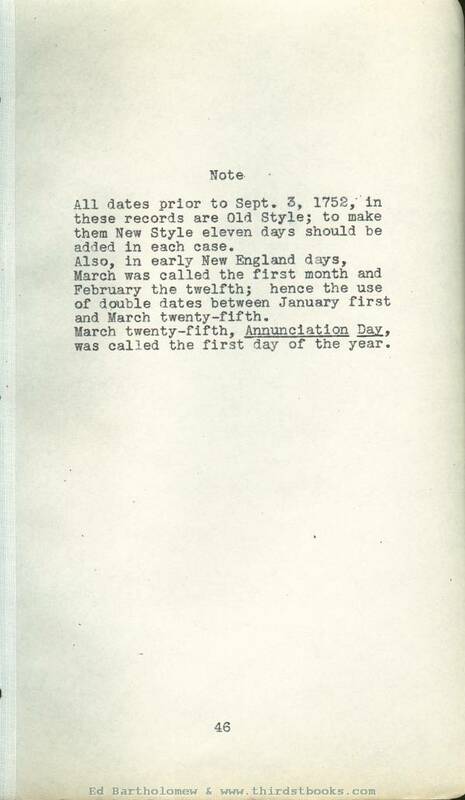 Also, in early New England days, March was called the first month and February the twelfth; hence the use of double dates between January first and March twenty-fifth. March twenty-fifth, Annunciation Day was called the first day of the year. VII. fl). HON. 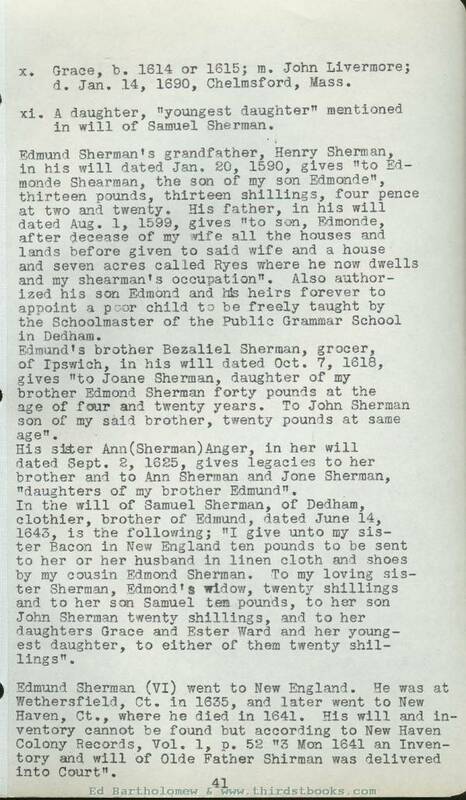 SAMUEL SHERMAN, son of Edmund and Joane (Makin) Sherman; baptized, July I2, 1618, at Dedham, Co. Essex, Eng. ; died Apr. 5, 1700, at Fairfield, Ct.; married 1840,' at Stamford, Ct. Mary Mitchell, dau. of Matthew and Sarah (Butterfield) Mitchell, and sister of the Rev. Jonathan Mitchell of Cambridge, Mass. 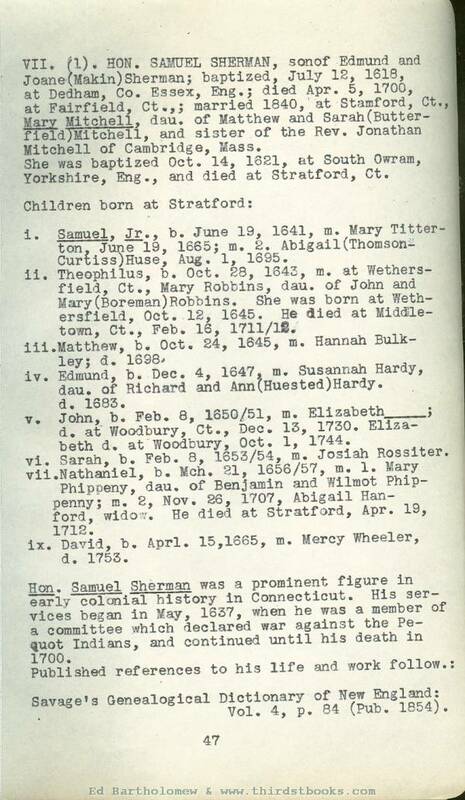 She was baptized Oct. 14, 1621, at South Owram, Yorkshire, Eng., and died at Stratford, Ct.
i. Samuel, Jr., b. June 19, 1641, m. Mary Titterton, June 19, 1665, m. 2. Abigail (Thomson-Curtiss) Huse, Aug. 1, 1695.
ii. Theophilus, b. Oct. 28, 1643, m. at Wethersfield, Ct., Mary Robbins, dau. of John and Mary (Boreman) Robbins. She was born at Wethersfield, Oct. I2, 1645. He died at Middletown, Ct., Feb. 16, 1711/12. iii.Matthew, b. Oct. 84, 1645, m. Hannah Bulkley; d. 1698.
iv. Edmund, b. Dee. 4, 1647, m. Susannah Hardy, dau. of Richard and Ann (Huested) Hardy. d. 1683. V. John, b. Feb. 8, 1650/51, m. Elizabeth___, d. at Woodbury, Ct., Dec. I3, 1730. Elizabeth d. at Woodbury, Oct. 1, 1744.
vi. Sarah, b. Feb. 8, 1653/54, m. Josiah Rossiter. vii. Nathaniel, b. Mch. 21, 1656/57, m. 1. Mary Phippeny, dau. of Benjamin and Wilmot Phippenny; m. 2. Nov. 26, 1707, Abigail Hanford, widow. He died at Stratford, Apr. 19, 1712.
ix. David, b. Aprl. 15, 1665, m. Mercy Wheeler, d. 1753. Hon. Samuel Sherman was a prominent figure in early colonial history in Connecticut. His services began in May, 1637, when he was a member of a committee whlch declared war against the Pequot Indians, and continued until his death in 1700. Vol. 4, p. 84 (Pub. 1854). Hartford; Deputy. Samuel Sherman, Vol. 1, p. 354. Gen'l Assembly of Court of Election, Hartford, Oct. 9, 1662, Mr. Sherman elected Magistrate. Ibid. May 14, 1663, Mr. Sherman elected Magistrate. Session Gen’l Assembly, Hartford, Oct. 8, 1663, Mr. Sherman, Deputy. Vol. 1, p. 409. Gen’l Assembly, Hartford, May 12, 1664, Mr. Samuel Sherman, Assistant. Ibid. 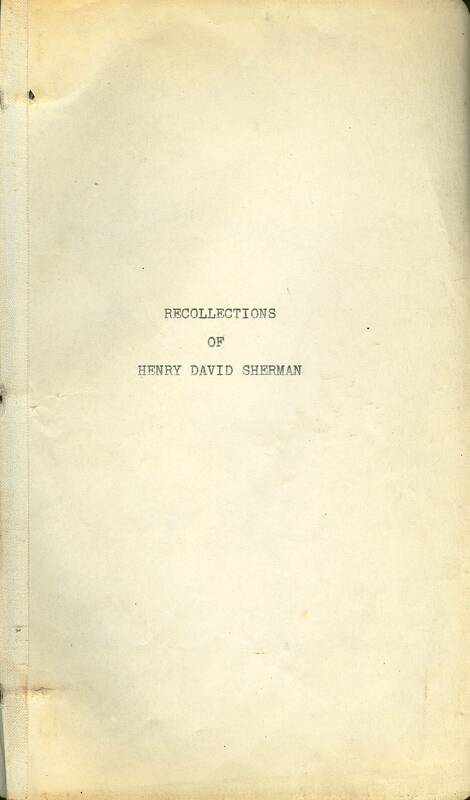 Oct. 13, 1664, Mr. Sherman, Assistant. Samuel Sherman was a member of a Committee for Defence, appointed at a general Session held at Hartford, called by the Governor, July 6, 1665. Commissioner for Stratford and Woodbury, appointed May 8, 1679. Commissioner for Stratford and Woodbury, appointed May 8, 1680. Commissioner for Stratford and Woodbury, appointed May 12, 1681. Commissioner for Stratford and Woodbury, appointed May 8, 1682. Deputy for Stratford, Oct. 11, 1683. Deputy for Stratford, Nov. 14, 1883. Deputy for Stratford, Oct. 8, 1685. Deputy for Stratford, May 12, 1687. Deputy for Stratford, Oot. 51, 1687. Deputy for Stratford, May 11, 1695. Deputy for Stratford, Oct. 12, 1699. Hon. Samuel Sherman settled first in Watertown, Mass., 1634. Moved to Wethersfield, 1636. Went to Stamford, Ct., 1640 or 1641, where he was one of the original proprietors. Was active in all public affairs. Was on committee "which declared war against the Pequot Indians, May, 1637. His name appears among the proprietors in Stratford records of 1650. May 11, 1655, he was chosen Magistrate of the New Haven and Connecticut Colonies United. In 1672 he was granted permission to make a plantation at Pomerang where he founded the settlement that became Woodbury, 1674. He was spoken of as "The WorshipfuI Mr. Sherman." 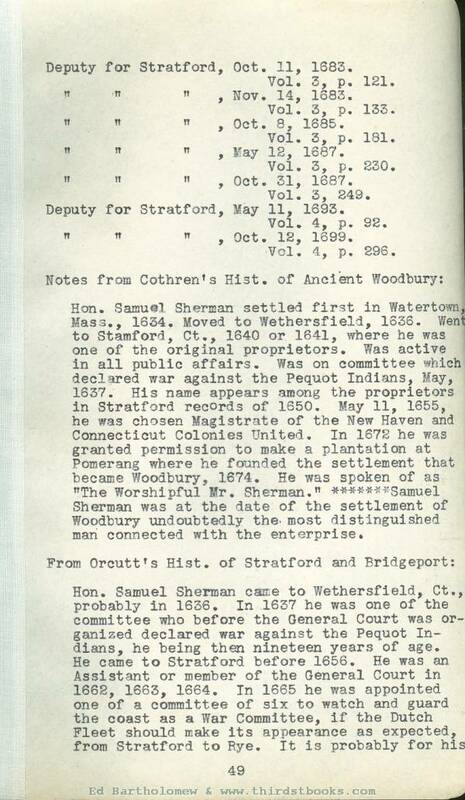 ******Samuel Sherman was at the date of the settlement of Woodbury undoubtedly the most distinguished man connected with the enterprise. Hon. Samuel Shermn was a leading man in the New Haven Colony, a conspicuous member of the church, and an Assistant from 1662 to 1667. Hon. 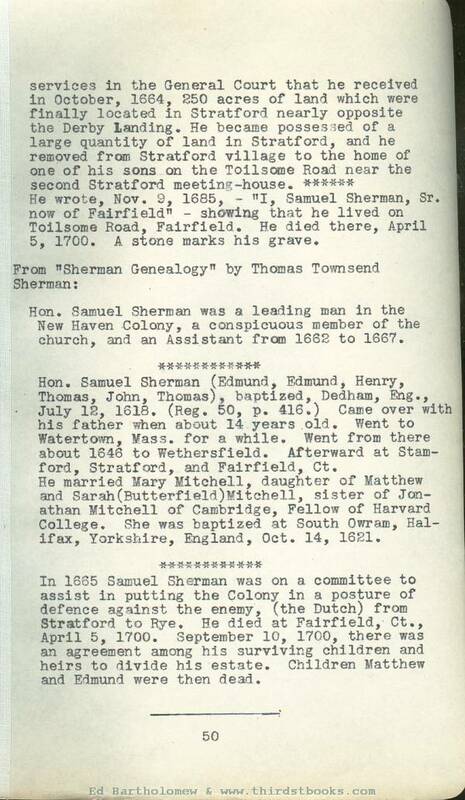 Samuel Sherman (Edmund, Edmund, Henry, Thomas, John, Thomas), baptized, Dedham, Eng., July I2, 1618. (Reg. 50, p. 416.) Came over with his father when about 14 years old. Went to Watertown, Mass. for a while. Went from there about 1646 to Wethersfleld. Afterward at Stamford, Stratford, and Fairfield, Ct. He married Mary Mitchell, daughter of Matthew and Sarah (Butterfield) Mitchell, sister of Jonathan Mitchell of Cambridge, Fellow of Harvard College. She was baptized at South Owram, Halifax, Yorkshire, England, Oct. 14, 1621. In 1665 Samuel Sherman was on a committee to assist in putting the Colony in a posture of defence against the enemy, (the Dutch) from Stratford to Rye. He died at Fairfield, Ct., April 5, 1700. September 10, 1700, there was an agreement among his surviving children and heirs to divide his estate. Children Matthew and Edmund were then dead.